WHO TRULY WORKS FOR THE PEOPLE! NOTE: I offer these historical articles in order to spotlight the fact that while our nation has been involved in war, there have been a few enlightened leaders in Washington, D.C. who have consistently worked for Peace. Needless to say, their hands have been tied. Representative Kucinich has re-introduced this bill each year; however, it has never been allowed outside Committee. “It is well known that in times of economic difficulty violence increases. When relationships are strained by economic hardship, domestic violence, violent robbery and abuse of children and animals all increase. When the world is facing possibly the largest economic downturn since the Great Depression, now is not the time to ignore social issues and interpersonal relationships. Now is the time to pay special attention to make sure that our relations and health do not suffer along with our pocket books,” stated Kucinich. The Cabinet-level Department of Peace authorized in the legislation embodies a broad-based approach to peaceful, non-violent conflict resolution at both domestic and international levels. The Department of Peace would serve to promote non-violence as an organizing principle in our society, and help to create the conditions for a more peaceful world. “Peace is a foundational principle of this Congress and of this country. This bill gives it a chance to have an animating power in our civic life by addressing the issues of domestic violence, spousal abuse, child abuse, violence in the schools and racial violence,” added Kucinich. Kucinich originally introduced this bill on 7/11/2001 … exactly three months before 9/11. He has re-introducted this bill each year since; however, it has never been brought to the House floor for a vote. Now in 2012, Americans must take a powerful stand for peace. The entire fabric of our society has been ripped asunder by violence everywhere we look. To stand silent and idle is no longer an option. The Peace Alliance, http://www.thepeacealliance.org/, offers an excellent non-partisan organization in which to work for Peace and a Department of Peace. It is up to “we the people” to transform our world! I worked on Dennis Kucinich’s presidential campaign in 2004. Although I have not met him in person, I came to know him as one of the finest men on this planet. To work on his campaign was a spiritual experience. To call his national campaign office was a blessing. Why? Because those of us who worked for him were striving to transform this nation into the magnificent country it was created to be. We knew Kucinich has the ability to lead us, the citizens responsible for this nation, in doing just that! Kucinich insisted that his campaign be characterized by the same integrity, positive attitude, honesty, and high ideals that he demonstrates each day of his busy, creative life. We were working for a statesman of such high quality that we could be proud to share his words with the public … to vote for him knowing that our country will be in superior hands with Kucinich in the White House. 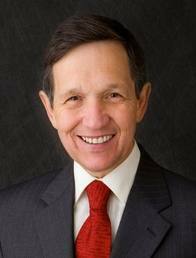 Kucinich was acting on knowledge and insights he had already placed into legislative form. On 7/11/2001—exactly three months before 9/11—Kucinich introduced legislation into Congress that called for a Cabinet level Department of Peace. He has re-introduced this legislation—HR 808—into Congress each year since. Another prominent Lightworker, Marianne Williamson, heads The Peace Alliance organization and works closely with Kucinich to bring the Department of Peace to fruition. You may read about the Department of Peace and get involved with the Peace Alliance by going to www.thepeacealliance.org. During the 2004 campaign, the workers heard innumerable times: “I would love to vote for Kucinich, but he is too short. He will never win.” Americans placed more value on physical appearance than upon leadership skills and Kucinich’s outstanding capacity to inspire people into action. His were the audiences that gave him standing ovations because they were inspired, not because they were participating in a pep rally for a particular political party. People yearned to vote for Kucinich, but lacked the courage of the man who inspired them. Instead, they voted for the man they thought could win. No one can win unless we, the people, vote for him/her. #3. The United States Constitution makes no provision for political parties. Americans have allowed themselves to be controlled by competitive political parties—parties for which the founding document of this nation envisioned no need. We must break this mold and vote for those persons who can truly lead this nation to greatness. We must learn to think for ourselves … to choose for ourselves, not allow our minds and actions to be controlled by propaganda. We must learn to recognize propaganda for what it is—an attempt to manipulate our thoughts and actions. Dennis Kucinich possesses the intuitive wisdom and intellectual knowledge to lead this nation and planet to peace and prosperity. He works in the Light of the Universal Christ Consciousness. Dennis Kucinich walks in the company of Beings of Light who have the welfare of this planet and all of its inhabitants as their only motivation for action. Filed under: Dennis Kucinich, Department of Peace, NESARA, Peace |	Comments Off on A LEADER IN THE U.S. CONGRESS WHO TRULY WORKS FOR THE PEOPLE!